For several different reasons, I was enthralled by this fine book now available as an e-book. First, it’s written by John Garrity, an exceptionally talented writer. Second, its backdrop largely centers on Carne Golf Links in a remote region of western Ireland in the town of Belmullet. Although Garrity first visited Belmullet in 1989, he hadn’t any intention of returning to the area until he heard golf course architect Jim Engh singing the praises of Carne, built after Garrity’s maiden visit. (Garrity would later write a celebrated article in Sports Illustrated about Carne in the summer of 2003.) Third, Engh also told me about Carne when I chatted with him in the early design stages of True North GC in Harbor Springs, Mich., in the summer of 2002. So that fall when I was invited to play some Irish links courses along with fellow golf writer Jack Berry, I lobbied that Carne be on our itinerary. As it turned out, the links course—ingeniously designed by the legendary Eddie Hackett–indeed was a revelation with its stirring beauty and magic. Okay, enough about me. Garrity immerses himself in Irish country life by renting an apartment in Belmullet for a few months allowing him to be a patient, acute observer and note-taker. In his initial 1989 visit, Garrity learned his paternal ancestors hailed from the area and where his great-grandfather fled abject poverty by boating out to an ocean liner bound for America. A good deal of the book is taken up with Garrity’s conversations with various cousins and townspeople exploring his roots and the local customs and lore. With a lesser writer, the sections might be tedious but in Garrity’s able hands, they remain lively, humorous and informative. Another linchpin of the narrative is Garrity’s quest to shoot an aggregate score of 90 or less by playing Carne’s demanding par-four 17th hole six times with three balls, a virtual 18-hole round encapsulated by a single confounding hole. It was a twist on something dreamt up by Garrity’s beloved and late brother Tommy, a former Tour player. The pair had played Carne several years ago before Tommy was stricken with cancer. 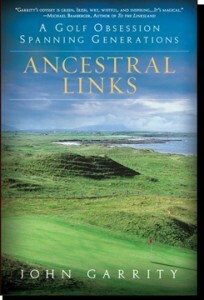 My favorite parts of the book were those chapters devoted to how this remote area of Ireland ended up boasting one of the most majestic links courses in the world. In 1984, Belmullet was a dying town with thirty percent of the houses empty. But a group of determined and wily local citizens gathered and discussed how to rejuvenate the area. After a non-profit tourism council was formed, a destination golf course was envisioned for 260 acres of unfarmable land on the edge of the sea. Garrity admirably recounts the challenges and hurdles in the process and how the group was able to persuade the 76-year-old Hackett, known for such links gems as Waterville, Donegal, and Ceann Sibeal, to lend his considerable talents to the design of Carne. In fact, the section on Hackett is so well done it only whetted my appetite for Garrity to have written more about this little known and often underappreciated maven of links golf. At this point if I were writing for The New York Times, I would be compelled to wedge in an obligatory quibble or shortcoming found in the text. But I’m not and I didn’t so that’s that. There’s much to relish in this book and you don’t have to have played Carne or Irish links or even been to Ireland to appreciate it. (Although personal memories of Ireland only heightened the delight here.) I always tell friends planning overseas itineraries not to spend all of their time playing golf, exhausting themselves and the clock by 36-holes-a-day marathons. Instead, take the time to take in and absorb the towns, the countryside, the pubs, the newspapers, and especially the people–their wit and their stories. Garrity has taken it all in and the reader goes along for a wonderful, insightful ride. In many ways, Garrity has written a heartfelt elegy to his parents and brother framing his emotions and reflections amid the rugged and inspiring links of Carne. A sense of loss shadows the book but also self-discovery, hope and redemptive love.